I have cooked for about as long as I’ve been allowed to hold a knife and turn on a stove. Fueled by my passion and desire alone, I flung myself into the world of food. The path that took me from a wide-eyed boy to a discerning Chef in New York City has been a challenging one, but needless to say.. food has inevitably changed my life forever. The reason I started blogging at all was to put my thoughts of food out there for the public, and whether people read them or not, I was gonna still gonna write. Now having this blog for over a year and a half, I have realized that I started blogging to get through a really difficult time in my life.. and that it has. A year ago I was living in Massachusetts and struggling financially, and feeling creatively stunted in life. I made a tough decision to leave my safe world behind and start a new life in New York City. Since then many things have changed but at the end of the day, food is still at the forefront and taking me on the adventure of my life. 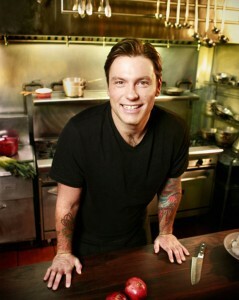 Tonight I discovered who Chuck Hughes is, and for that I am thankful. I have seen several commercials for “Chuck’s Night Off,” and thought to myself… great energy, good-looking, charismatic, food looks good.. great combination. Tonight though, I learned he is so much more than that, he is both a culinary genius and human. Getting in tonight, I popped on the TV and on came the first episode of the new season of “The Next Food Network Star.” Glued to the TV I watched Chef Hughes along side Chef Chiarello create two beautiful dishes within a strict timeframe with even more limiting resources. They came in second place to Jeffery Zakarian (my favorite to win the season), but definitely showcased their talents. Impressed and left with questions about who Chef Hughes was, I started Googling him. I learned he is Thirty-four years old and a recent “Star” Chef from Canada. A few moments later a “Chefography” of Chuck Hughes came on.. and then my admiration for him deepened. A true blue “guy’s guy,” the more I watched the more I became enthralled with Hughes. An honest man who rose through the ranks of the kitchen from his own determination and hard work, stumbling into a world of addiction but having the strength and conviction to admit the presence of a problem and asking for help. Garde Manger, the namesake of Chef Hughes crowning glory in Old Montreal is a beautiful restaurant, packed every night, preparing some of the best food in the old city. He is in every way the modern Chef. Brazen, determined, precise, not without faults, but driven to always learn more and better himself. He is my new inspiration and has reminded me what I set out to do, where I came from, and where I want to be. At the end of the day Chef Hughes has accomplished many things but has also shown an immense amount of humility, and that even in this day and age with enough ambition, you can achieve your dreams and more.